“Firstly I’d like to say a big thank you to Becky for asking me to guest post on this blog, I feel very honoured! 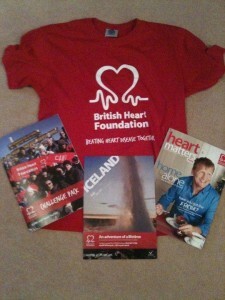 As you may have read in the New Year’s Resolutions Competition, I am taking part in Trek Iceland later this year to raise money for the British Heart Foundation, and would like to share with you a bit about why I am doing this, how my training is going, and what I will be doing on the trek itself! My dad was lucky enough to survive a heart attack back in September 2009. He was 58 at the time, and up until that point had always been very fit and healthy. He could get stressed at times (can’t we all), and probably drank a little bit more than he should, but he ate well, exercised regularly and wasn’t overweight. It was a big shock to us all. He didn’t get the crushing chest pain symptoms that all the soaps seem to associate with a heart attack. Instead he had just felt generally unwell, with what felt like bad indigestion and a bit of a temperature – ironically he thought he had swine flu! Mum dropped him off at our local walk in centre on the way to work. As he was explaining his symptoms, he collapsed, having a heart attack in the appointment room with the GP. Because of where he was, the doctors and nurses were able to act very quickly, and use a defibrillator to save him, then taking him to our local hospital where he undertook surgery to fit stents to two of his arteries. This procedure is quite frankly amazing, and I still can’t get my head around how medical science can achieve such things. Without the groundbreaking work of the British Heart Foundation and their continual research into prevention and life saving procedures, my father quite simply would not be here today. I have been a fundraiser for a number of years now, being part of Midlands Action Team for Cancer Research UK for just over 3 years. I really enjoy fundraising and volunteering, and get an amazing sense of pride from supporting others raising money for a great cause. Whilst looking into what I could do for the British Heart Foundation, I came across their International Challenges section and started to have a read. Trek Iceland immediately stood out as the challenge for me, and before I knew it I was signed up and raring to go! I have always been a bit of a home lover, and a bit fan of creature comforts like a soft bed and hair straightners, so people that know me well will know that even contemplating an international challenge was a big deal for me! The trek is four days long and involves trekking over varied terrain including hilltops, rough sand filled lava, narrow gorges, flat lake beds, mossy lava fields, small gullies, and river crossings – argh! With 7-9 hours of treking each day, this is definitely going to be an experience!! It even mentions something called “scrambling”, which sounds like it might be interesting!! This will be the first time I have ever camped in my life and I have a hell of a lot of training to do, but I am looking forward to it! The training plan sent through with my registration pack is enough to make any one go “gulp” – recommending a mixture of Aerobic Training (e.g. running, cycling, swimming, cross country walking etc), Strength Training (e.g. arms, shoulders, back and abdominal exercises), Stress Training (e.g. 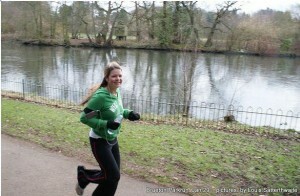 high intensity bursts such as sprinting up hill), and Recreational Exercise. I would like to say I am quite fit, but I would probably be lying. I used to do a lot of running a few years ago, and I did do an overnight walking marathon back in 2009, however it feels very much like “use it and lose it”, and I am feeling quite out of practice at the moment! I have started running once a week with my cousin and I’ve also signed up to the weekly Park Run which is a timed 5k at 9am on a Saturday morning! Although it’s early to get up on the weekend (I enjoy my lie ins! ), this course is timed and recorded with a barcode, and the group celebrate personal bests, regardless of how fast you are! So far the fundraising is going well, and I have raised over £700 in addition to the self funded £1000. I was also lucky enough to get support from Brasher, who kindly gave me a pair of boots to raffle off to help my fundraising. I’ve set up my Trek as a cause on easyfundraising and passed this to everyone I know, including my employers who will be supporting me by using the site for our hotel and travel bookings. To be able to add funds to my target without costing my friends a single penny obviously has big advantages, and every penny counts! I am not relying solely on sponsors for my trek (as I need to raise around the £3k mark), so have also applied for a collection license with my local council. This will allow me to do a street bucket collection at my local shops, and I hope that my local community will be able to spare some loose change to support my challenge. Overall with a mixture of sponsorship, easyfundraising support and fundraising between now and July, I hope to smash my target, and raise some much needed funds for the British Heart Foundation, whilst having loads of fun in the process!